When Disney announced their line-up of back-catalogue animated movies getting the live action treatment, I can’t say I was that excited. I still haven’t seen 2010’s Alice in Wonderland, nor did I catch Cinderella. I did see Malificent, however, and whilst a flawed film, it certainly had its moments. But then along comes Jon Favreau’s The Jungle Book, which shows that great things can come out of Disney’s rather cynical plan. The plot of this film differs from the 1967 animation quite a bit, particularly in the final act, whilst neither of them have stuck that closely to Rudyard Kipling’s stories. 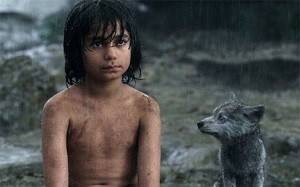 We meet the young boy, Mowgli (Neel Sethi, the only human onscreen), when he’s a member of a pack of wolves led by Akela (Giancarlo Esposito). Overseen by the panther, Bagheera (Ben Kingsley), he’s happy enough being the only man cub in the jungle. When evil Shere Khan (Idris Elba) returns to the jungle however, he demands the life of the boy, so Mowgli sets off to return to the kingdom of man. First things first: the visual effects are stunning. If you thought the CGI tiger in Life of Pi was impressive, wait till you get an entire jungle full of creatures. This is a serious contender for the best VFX of 2016, and there were probably only four or five shots where the effects were less than perfect, mainly to do with young Sethi running in a digital environment. Sethi does a good job. There’s nothing revelatory about this young performer, but considering he spends the entire film acting alongside creatures that aren’t there (or the Jim Henson Creature Shop-created and operated puppets that were used as stand-ins) then you realise that he’s wonderfully convincing. It’s hard to complain about the multicultural casting either, even if the range of accents makes no sense in a film ostensibly set in India (though no reference is made to the countries of man at all.) Sethi and Kingsley are joined by Bill Murray, Idris Elba, Lupita Nyong’o, Scarlett Johansson, Giancarlo Esposito, Christopher Walken and Garry Shandling. Kingsley, Murray and Elba are the stand-outs, bringing real gravitas to their roles. The film is wonderfully paced. At 105 minutes, it’s great to see a blockbuster that isn’t over two hours, whilst Justin Marks’ script boasts some great set-ups and pay-offs wrapped in subtly witty dialogue. By the time the film reached the climax, I was really on the edge of my seat. Plus, it’s hard not to cheer any time Bagheera goes into fight mode. As frustrating as the preponderance of remakes heading to our screens at the moment is – not to mention the incoming The Legend of Tarzan and Andy Serkis’ own attempt at the Jungle Book set for release in 2018 – the good news is that this is a great film. This entry was posted in Film Reviews and tagged Action/Adventure, Childrens, Fantasy by Stuart Wilson. Bookmark the permalink.